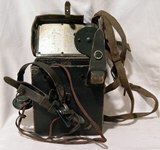 Field telephone type "F" pattern 1933. Metal plate for Italian Royal Army vehicles. Technical tool for reading and calculating distances on maps.